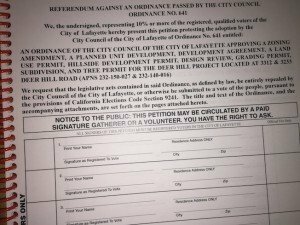 After a 24 day collection period, Save Lafayette’s petition drive has delivered the signatures of 2300 Lafayette voters to the City clerk and the signature collection period has closed. 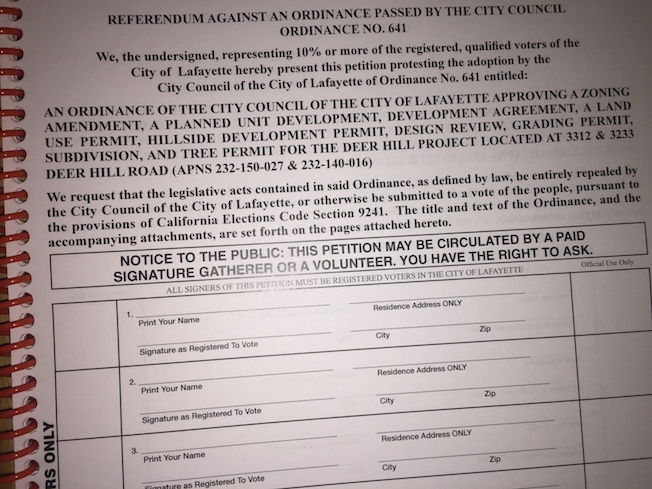 This represents well over the 10% of Lafayette’s registered voters that we required; the petition to bring the “Homes at Deer Hill” resolution to a referendum leaves little doubt as to what voters want: slower growth, less development, more open space, less traffic and to be have their wishes heeded by the City. The petition, once validated by the County and City, will provide the City the opportunity to either rescind their prior approval of the project or to provide the community with the opportunity to vote on this huge project. As residents are all too aware, Lafayette has experienced rapid growth in recent years, by a factor of six over historical rates. The overcrowded schools, the BART parking lots filling earlier and earlier, the congested shopping areas and long traffic delays drastically reduce the city’s semi-rural character and run counter to what folks love about living here. Save Lafayette’s near-term goal is to give the community a voice in the process and to achieve a better use of the “Homes at Deer Hill” site consistent with the City’s General Plan, Hillside Ordinance and community identity. But our fight won’t end there. Lafayette’s growth needs to be kept aligned with its transportation capacity, school capacity and not to the detriment of its hillsides and vistas. This initial effort was sucessful and we are very grateful to our donors and to all of the petition gatherers and signers for volunteering their time. However our continuing legal costs need your support, please click the “Donate” button on our site so we can continue to give voice to the wishes of Lafayette’s citizens. Congratulations! Hopefully the message of this petition is heard throughout Lafayette. While “The Homes at Deer Hill” is the most time-sensitive right now, I hope we can leverage the momentum (and expertise) of this movement to hit the “pause” button on all the big development projects pending across town.